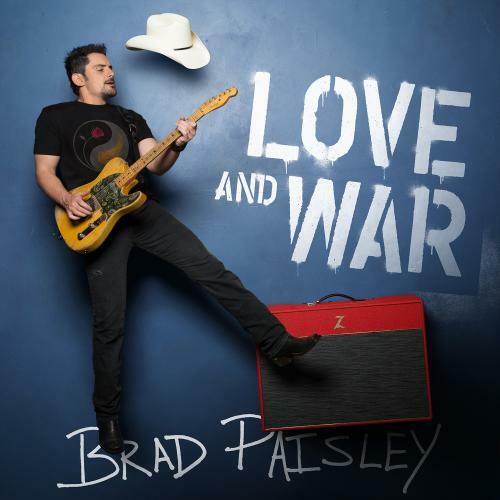 LOVE AND WAR, the newest album from country music superstar Brad Paisley, debuts at #1 on Billboard’s Top Country Albums chart, marking Paisley’s 9th consecutive studio album entry at the chart’s top position! Luke Wooten and Paisley co-produced 13 tracks on LOVE AND WAR, with Timbaland and Luke Wooten producing “Grey Goose Chase” and “Solar Power Girl" and John Carter Cash and Luke Wooten producing “Gold All Over the Ground.” Kendal Marcy was executive producer for the studio album. Download and stream the studio album LOVE AND WAR HERE and HERE. Available for the first time on April 28th, Brad Paisley’s visual album LOVE AND WAR can be streamed for a limited time exclusively on Apple Music HERE. Prior to the visual album release, Paisley hosted premieres at the Country Music Hall of Fame in Nashville and also at Regal LA Live in Los Angeles last week. Paisley viewed the 62 minute film with the audiences of fans and friends and then took questions afterwards. The Los Angeles crowd was treated with an acoustic performance by Paisley and legendary Rock and Roll superstar John Fogerty. They played the title track of the album “Love and War,” which they co-wrote, as well as a few classics. Directors involved with the LOVE AND WAR visual album were Paisley, Dave Brown, Derek Cressman, Frank Agnone, Jeff Venable, Jim Shea and Todd Cassetty. Producers included Ben Skipworth, Frank Agnone, Jim Shea, Kendal Marcy, Mark Kalbfeld and Todd Cassetty, and executive producer was Kendal Marcy. “Last Time For Everything,” Brad Paisley’s current single from LOVE AND WAR, was last week’s most-added song at country radio. Co-written by Paisley, Smith Ahnquist, Brent Anderson, Chris DuBois and Mike Ryan, “Last Time For Everything” was preceded by the smash hit “Today” which was the superstar’s 24th #1 single. Brad Paisley is a critically acclaimed singer, songwriter, guitarist and entertainer whose talents have earned him numerous awards, including three GRAMMYs, two American Music Awards, 14 Academy of Country Music Awards and 14 Country Music Association Awards (including Entertainer of the Year), among many others. He has been a proud member of the Grand Ole Opry since 2001. Paisley has written 21 of his 24 #1 hits including his most recent smash, “Today.” The song has resonated with fans around the globe with the music video garnering over 42 million views, so far. “Last Time For Everything” is his current single and his 11th studio album, LOVE AND WAR,was released April 21. On April 28, LOVE AND WAR was released as country music’s first ever visual album for a limited time exclusively on Apple Music. Paisley has partnered with Boot Barn® and developed an exclusive line of jeans, hats, T-shirts, jewelry, belts and woven shirts called Moonshine Spirit by Brad Paisley. Connect with Brad at www.BradPaisley.com, www.Facebook.com/BradPaisley, on Twitter @BradPaisley, on Instagram @Brad Paisley, and YouTube at YouTube.com/BradPaisley.